No one is surprised when Wesley James introduces a card effect that breaks new ground. He has been doing so for nearly fifty years. However, when he releases two innovative new plots in one dedicated volume, you know they must be incredibly powerful. 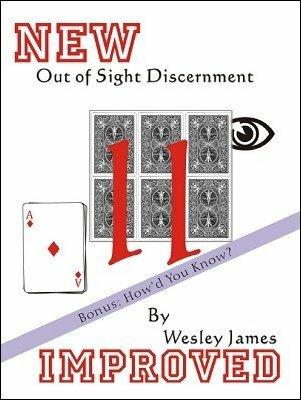 Out of Sight Discernment II and How'd You Know are two such effects. From a shuffled deck, which could be borrowed, a spectator is given the opportunity to think of any one of potentially dozens of cards you offer to show them at different random points within the deck. When the spectator has focused their thoughts on one card, the deck is cut and briefly shuffled and the spectator is instructed to cut the deck at exactly the spot where they believe their card rests. Without knowing how, the spectator successfully does so, finding their thought of card atop the packet to which they cut. The effect can be repeated at will with a different card each time. Remember, the deck could be borrowed. From a shuffled deck, which could also be borrowed, the spectator is able to perform a rather novel and completely impossible effect. He, she or they (two spectators could be involved) are able to determine information they could not possibly know, determine or keep track of while you perform a series of face-up and face-down shuffles. The spectator(s) are able to determine the exact position of a freely selected card in the deck and precisely how many cards are facing down. They happen to be the same number. No effect of this type has ever appeared in print. Neither effect is self-working but, while they are bold, they are not particularly difficult, though they will require some practice to develop smoothness and rehearsal to integrate the patter with the action. Given the effort they deserve, you have two absolute miracle effects. 1st edition 2014, 25 pages.